This Saturday is Registration Day!!! It will be held at Mahoneys Reserve (9.00am – 11.00am). If you have not yet registered for the season ahead, this is the perfect opportunity to do so. It is really critical we know who is playing this season – so that we can manage all our teams and resources. If you have not yet registered, and cannot make Registration Day – please complete and return the attached Registration Form ASAP. As always, all families and children are welcome to play at Nunawading. Please also encourage all your families and friends to come down and join Nuna!! We are looking for players of all ages – especially some new Girls to join our Girls Teams! We will also have apparel to try on, purchase and order at Registration Day. Again, if you cannot attend, please complete the attached apparel order form. We will be doing an order for apparel immediately after Registration Day – so please be mindful that if you do require apparel, now is the time to order some – to ensure it is available when matches commence in October. Well after last week’s wash out – the weather for Sunday morning looks great!! Training will be on for all age groups, from 9.00am – 10.15am. If your child did Milo (now Woolworths Junior Blasters) last season, and is interested in playing the next level of cricket this season – please feel free to bring them along. If you cannot attend, that is fine – however if you are free, please come down for a hit. We will have various levels of training for all age groups. This week, Nunawading Cricket Club is running Cricket Clinics in conjunction with Cricket Victoria at our local Primary Scholl (Burwood Heights). These have been very successful, and we are hopeful they will attract many new families to Nunawading. Special thanks to Clinton Kennon and Sam Norman from Cricket Victoria for running the classes, and also Burwood Heights Primary School (Principal Esther Wood and PE Teacher Le-Anne Mason). 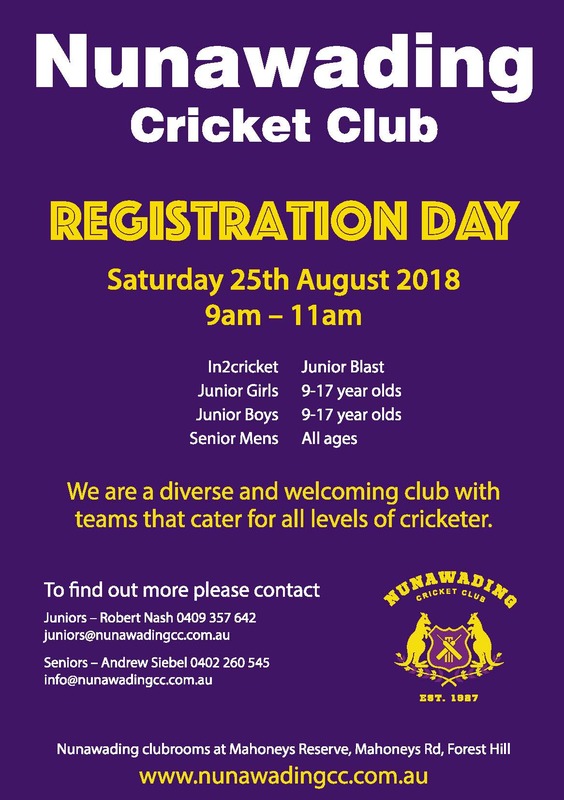 Also special acknowledgement to the following Nunawading Cricket Club members, who gave up their time to assist running the classes – Rob Ferdinands, Scott Witherden, and Carrie Philpott. Without everyone’s involvement, these sessions would not occur. McDonalds have been a great supporter of local sport for years. At Nunawading we are fortunate to have the support of McDonalds at Blackburn South (127 Canterbury Rd) and Forest Hill (Forest Hill Chase). These stores have provided Nunawading CC with Achievement awards and Food vouchers in recent years – which our Milo (now Woolworths) children greatly enjoyed. As you would all know, there are many healthy options available now as well. Additionally, for our older Juniors, casual employment options are often available – and I know from friends of mine who have their teenagers working at Blackburn South, not only is good payment received for their work – the training program provided, ensures many new skills are learnt! !